Deserts conjure up specific ideas about topography: typically, that they are dry and sandy dunes or rock, or a mixture of both. But deserts are far more than this and there are multiple types. How we define the desert biome are not about the types of rock, or the amount of sand, or even the temperature because there are both cold and hot deserts. The simple explanation is that deserts are topographic landscapes that receive little precipitation in a typical year. The threshold is 10 inches, or 25cm. But more than simply having low rainfall, a desert is “arid”. This means a high rate of water loss through plant reclamation (called transpiration) and through evaporation. These two aspects are combined into something called evapotranspiration. This is the amount of water that the landscape would lose when available (1). For deserts, evapotranspiration ratio exceeds average annual rainfall by anything from 2:1 to 33:1. The higher the ratio, the less available moisture there is. The coarse nature of the soil means most moisture seeps through the top soil rapidly. Furthermore, what precipitation a desert does experience is erratic. The average rainfall is just that. A desert may receive far more than the “average” in one year and not experience any rainfall the year before and the year after. Deserts will differ depending on their climate and location and their overall aridity can influence many things, not least of all the ecology, food chain, plant and animal types. High evaporation leaves behind higher salt levels, affecting further which plants can grow and the individual size and the numbers of herbivores that may feed on them and, in turn, carnivores. Some experience vast temperature fluctuations, especially hot deserts which may reach unbearable heat during the day and extreme cold at night (2). This is because the rock and sand absorb heat during the day and releases it at night. There may also be an extreme variation between warm and cool seasons, including extreme winds and storms due to the mixing of cold and warm air. Deserts are vitally important to the planetary ecosystem. They cover approximately 1/3 of the dry land of our planet (3, p1). They are also amongst the most fragile and endangered biomes. There are four broad types of desert: coastal, cold, hot & dry, and semi-arid. These are generally hospitable and don't have the extreme temperature fluctuation that other types experience. Life is more abundant here, the soil less acidic, and tend to be arid due to adjacent topography such as mountain ranges or lakes and waterway networks that draw off most of the precipitation that they would otherwise experience (4). Coastal deserts experience a brief winter of moderate average temperatures of 5�C/41�F for winter while summer typical reaches an average of between a mild 13�C/55�F to warmer 24�C/75�F. The precipitation is lower, and this type of desert is better at retaining what little moisture it harnesses - on average around 5 inches or 13cm annually. What isn't drawn off by mountains drains away from the porous soil to find its way into waterways a little farther away. An example of the coastal desert is the Namib. Its annual precipitation falls as snow which may sometimes remain on the ground until the summer before it melts. If the temperatures don't rise sufficiently, it may remain for over a year. Their winters are extremely cold, typically between -2 and 4C (28.4F to 39.2F). Summer temperatures are pleasant and surprisingly warm, typically on average between 21 and 26C which is between 69 and 79F. Precipitation is relative and although fall and winter receives most of it, it is generally lower than other landscape types and it is insufficient to support too much life - hence why they are considered deserts. An example of a cold desert is the Gobi (5). 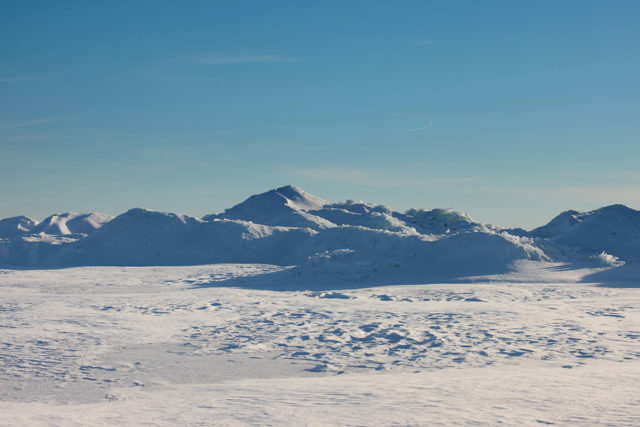 Some feel that Antarctica's interior is a desert due to low precipitation. What we think of as the “typical” desert, usually indicated with the sand dunes of North Africa and the Middle East, isn't quite as empty, hot or bleak as we might think. While they do have hot summers (43-48C or 110-120F), the annual average is a much cooler 20-25C or 68-77F. Night temperatures are an average 10C or 50F. They also experience cold winters, a season in which the low levels of precipitation usually fall to -18C. Summer night-time temperatures drop considerably which is why the annual averages are so extreme. Surface albedo is high - heat acquired during the day is radiated at night. This type experiences no more than 11” (28cm) of rainfall annually while many experience even less than that. Evidence from The Atacama Desert, for example, suggests that some areas have never experienced precipitation. Their barren appearance is broken by the occasional tree; shade and coverage is rare, and this is where you are most likely to see sand dunes. The Sahara is a hot and dry desert (6). Semi-arid deserts have, by definition, higher levels of precipitation compared to the other three types featured here, although not a great deal more. They are also not limited by temperature. They are milder generally, but they can exist farther to the north, meaning there are colder and warmer types. Daytime and nighttime temperatures are not as extreme, and neither are the divisions between summer and winter. There is some debate over whether they should be considered deserts at all but a type of plain or “steppe”. However, others argue that the other topographical features - of low precipitation (1-2” or 2-4cm annually) and high evapotranspiration leave them firmly in the desert category. Examples of colder semi-arid deserts include the Nearctic zones which incorporate Newfoundland and Greenland. Warmer examples are the Sagebrush of Montana and the Great Basin, and much of Australia's Outback (7). Summer average temperatures are between 21 and 27C while rarely going above 38C as the hot & dry types of desert often do. Deserts, despite a reputation in some quarters as a barren and useless wasteland or as problems to be solved, have been a way of life for many different peoples. Ancient Egyptian society began along the fertile banks of the River Nile which is buffered on both sides by hot & dry desert (8) which they saw as vital to their culture. Some attribute the arid environment of the Egyptian interior to the development of their complex culture and especially their rituals and cults surrounding death. It is particularly believed that the desiccated nature of bodies as found in the desert dying of exposure or from natural causes provided inspiration for their experiments and developments leading to the mummification process. Certainly, the dry environment of western Egypt where the pyramids are located would have been the perfect environment to prevent the sort of cadaver degradation seen in biomes with higher precipitation and humidity. Similar theories have been expressed about the development of mummification in the South American culture of the Chinchorro who lived in the Atacama Desert, quite possibly the driest desert on the planet (9). Even before this, the deserts have provided useful environments for resources and hunter-gathering. Various tribes of Native Americans made their homes in the deserts of North and Central America, as did the Kalahari Bushmen and Australian aborigines. Deserts are ideal for tracking animals and provide enough food in the right volumes to support hunter-gathering communities. It's no wonder we find so much archaeological remains in deserts. 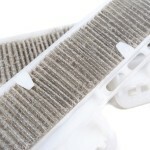 Firstly, they were well-used by people of the ancient past and secondly, the lack of humidity increases the chances of survival of organic material. Other cultures quickly adopted semi-nomadic lifestyle and took livestock with them on long journeys across the desert, learning locations of water and living off the animal produce, using animal skins as tents for shelter, and utilizing other parts of the animal such as milk, bones, and meat. Even today, peoples such as the Bedouin still roam the deep deserts of the planet although their lifestyle is more semi-nomadic (10). Successive civilizations harnessed the resources available in deserts for millennia, from mining to harnessing water supplies from springs into irrigation to grow crops, and stone, deserts have generally been seen as a resource. It wasn't until the early Middle Ages and the explorations the likes of Marco Polo that we begin to see wonder and observation in the desert biomes, particularly the Gobi (11). This was part of the Silk Road, the trade route between the Far East and Europe which was vitally important to the Eastern Roman Empire and the Alexander's Greek Empire before it. By Marco Polo's time, the journey was well-established, but his writing was the first volume. Polo and his father were the first westerners to visit China's modern capital. He was famously appointed to the Chinese Royal Court. Today, Marco Polo is one of the world's most famous early explorers, inspiring the likes of Christoper Columbus and Ferdinand Magellan. It would take several hundred years and the travels of Charles Montagu Doughty before any more important works were to come; his two-volume book Travels in Arabia's Deserts was published in 1888. He would later prove to be one of the most inspirational early travel writers to the modern age (12). The work included many observations about deserts and their uses, functions, and the sense of wonder. It is valued as much for its vivid descriptions and beautiful writing as it is for its content. Slightly later Antoine de Saint-Exupéry utilized the new transport of flight to bring a new dynamic to travel over deserts; a plane crash in the Sahara almost killed him but he was found by Bedouins (13). His travels in the Arabian deserts were extensive, as were those of Gertrude Bell - one of history's most famous female explorers. Yet her work could not hold a candle to the phenomenal work of Freya Stark (14) who published 20 books featuring the deserts of the Middle East. Other important figures in the early 20th century include naturalist Uwe George who lived in several deserts for part of his life and poet Robert Frost who also explored them. Until the early-mid 20th century, interests in deserts was one purely of exploration and travel, as highlighted in the previous section. The birth of the science of eremology (the study of the desert biome) began in the mid-20th century and with the dawning of the understanding of such environmental concepts as human geography, ecology, and, of course, conservation. It had been widely known thanks to various travel volumes that deserts were anything but lifeless wastes. One of the earliest remits of the United Nations was conservation. A growing problem in the 1960s concerning such issues as pollution and public health led to the development of a number of environmental standards and conservation issues for the assembly of world powers. UNESCO now has a chairperson dedicated to Eremology, such is the importance of the preservation of the desert biome for cultural and ecological reasons; as discussed previously, various peoples have lived in deserts for millennia and it remains an important part. This role has been in place since 1994. Today, researchers into the desert biome understand the importance of their conservation for these reasons, but also for biodiversity (15) and the unique biological makeup of such landscapes. Many species that live and thrive in desert environments do not exist in other biomes. Yet eremology is also the study of how deserts are formed. As well as preserving the deserts that we have, it is also dedicated to ensuring that human activity such as climate change, agricultural practices, intensive resource use and other activity does not create deserts in other landscapes, ecosystems and biomes. 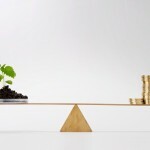 The UNCCD (United Nations Convention to Combat Desertification) (16) now has a delicate balancing act between preservation and holding back desertification. Some of our greatest archaeological finds have come from desert environments. As with anaerobic conditions of wetlands where organic material is cut off from microbes, such material survives in deserts due to the lack of moisture and bacteria that can eventually break it down. This is the reason for the survival of many pre-dynastic Ancient Egyptian bodies from shallow graves in the desert. Without the low humidity and desiccation, they are unlikely to have survived so well (17, p60). These bodies predate the mummification process and therefore, no embalming fluid or removal of organs that degrade quickly as seen in the later industrial process of the complex society. The same is true with the mummies of the Chinchorro peoples of the Atacama (a cold desert). What is most remarkable about these mummies is that they predate the Egyptian society by some 2,000 years and they used some of the same techniques at times (9). But the archaeology of deserts is about far more than simply the preservation of artefacts and their improved chances of survival. Various archaeological disciplines examine other areas of the desert. Water: Deserts are areas of low precipitation and low humidity which seems in direct conflict to the requirement of water for all living things. It's a great source of examining technologies from the simple to the complex, of acquiring, harnessing, storing and preserving water and its supply. But more than that - what importance (practical or spiritual) do those people place on water? Water engineering and mechanics are also of interest to archaeologists of desert areas. It's an interesting area of study that shows both human ingenuity and human potential for self-destruction. The irrigation of Mesopotamia during the first civilizations is one of the most remarkable feats of both. In the first instance, filtering water from the Euphrates and the Tigris rivers to the desert interior allowed for the building of enormous cities. The region, despite having lush valleys around and between the rivers, had much lower precipitation than Egypt which relied on annual Nile flooding (18). Yet the irrigation that allowed for the civilization to develop was also its downfall as over-irrigation led to consistent crop failure as water evaporated, leaving behind salts that would eventually saturate the land (19). The reputation of deserts as cold and lifeless is unfounded and it has arguably led to desert biomes being ignored in research literature compared to others (20). Many certainly seem bereft of life, certainly during the day in summer in hot deserts when temperatures are potentially scorching, and winter in some cold deserts where subzero temperatures make life difficult. However, they are abundant with both flora and fauna. What is so great about deserts as biomes, is their unique biological profile. Species exist in these environments that simply do not appear elsewhere. The Mojave Desert is a case in point; it's one of the harshest environments on the planet with a humidity level that rarely goes higher than 40%, yet it maintains abundant biodiversity throughout the seemingly barren topography (21). All species have adapted to live in this harsh environment and many are protected because of their geographical limitations and delicate ecological requirements of coping with the high temperatures and dry environment. Typical botany include succulents such as cacti which do not have leaves like other species, but spines to protect the fleshy body of chloroplasts adapted to store water, and shallow roots to quickly absorb the little moisture that makes it into the topsoil before evaporating away or soaking through. Similar specialization is also true of fauna which have high water retention, do not have the capability to perspire, and tend to be cold-blooded and small. Larger animals and mammals are rare although this is not always the case. Camels survive well in deserts because of their high water retention and survive quite happily in temperatures up to 48C / 120F. These are two rare examples of both warm-blooded and larger animals that live in hot desert environments. But what about cold deserts? They have received less attention than their hotter or semi-arid counterparts. We do understand that as they are in the extreme latitudes, that means most cold deserts tend to experience periods (months) of continual dark in the winter and periods of continual sunshine in the summer. This too has an impact on local biodiversity. Like their hotter counterparts, plants must be drought resistant. But succulents do not survive in these environments because of the cold. The most common type of plant in cold deserts are grasses and they form in clumps on rocks and in areas where the little moisture is most abundant. Shrubs occur in some places and the types of plant you might see on scrubland, but this is rare. Trees are also rare with only a handful of species such as the camel thorn acacia in the Gobi (23) and the pistachio tree which grows in the cold deserts of Iran. Animals in cold deserts are warm-blooded and larger than their hot desert counterparts. Typical examples include types of deer and antelope present in most cold deserts, sheep and goats likewise, and in South America llamas and alpacas. As far as carnivores are concerned, this is the realm of the wolf, the snow leopard, and jackals, depending on where in the world the desert is located. Small mammals are much more abundant and cold blooded reptiles are less abundant. In fact, scorpions appear in just one cold desert - the Iranian Desert. Desert is one biome type that researchers and conservationists do not want to expand all the while ensuring that the deserts we presently have do not disappear. The major reason for this is that desert is of low agricultural quality, low biodiversity, and an extreme environment. Climate change presents a risk of desertification of present marginal landscapes. We know this occurs from paleoenvironmental data (24). Many of our deserts contain the remnants of ancient lakes, indicated by former water channels and preserved biotic and abiotic materials indicative of previous presence of water. As deserts are the most extreme environments on the planet, they are prone to the most change. Radiation is intense - both in terms of how much deserts receive and how much they reflect back into the environment. The expansion of desert can directly impact global average temperatures further, increasing water evaporation in adjacent areas. Even though the plant and animal species that exist in hot deserts are well-adapted to those environments, we know from studies that such organisms are treading a fine line over environmental tolerance; some are even at their limits, according to the IPCC (25). Both The Sahara and The Namib are extremely hot deserts and in recent years have experienced some of the hottest temperatures to date. Pakistan and Iran have also experienced record dry spells and high temperatures in the last decade. Even semi-arid desert climates are experiencing an increase in hot and dry spells, becoming more parched and experiencing wildfires in areas where scrub, brush and tree cover is more abundant. California, for example, has always experienced summer wildfires but the season for the fires is getting longer with the increased drought the state is experiencing. Continued drought, lowering precipitation and a dropping of the water table means plants cannot grow as abundantly. This creates a high risk of expanding desertification. The risks are highest in the 50�S-50�N range which is the latitudes within which the hottest and driest desert climates presently are (26). Evidence demonstrates that the deserts of the Arabian Peninsula alone show increased water vapor feedback, much higher sensitivity, and increased sensitivity in deserts to greenhouse gas emissions. Simply, deserts become hotter and drier during a warming climate with wider implications for the warming climate. That makes this type of biome one of the most useful types for understanding and tracking climate change now and for the future. As well as biodiversity and their cultural significance, deserts are also useful economically due to their unique geological profiles or their environmental formation processes. The desert biome is one of the most important. There are 15 mineral deposit types on our planet and 13 of them are found in deserts. This makes the desert an important place for mineral resources and for local and global economy. The reason this is the case is how water leaches through the ground or through evaporation so quickly that mineral deposits are left behind. We discussed the problem with irrigation in Mesopotamia in the archaeology section where increased salt deposits made agriculture more difficult. This is a similar but natural process and it leads to the formation of large metal deposits in particular. Typical mineral resources found in desert regions (both hot and cold) include salt and borates, and gypsum. Borates occurred in high density in the Great Basin Desert here in the US. From there, borate was taken to Death Valley to the emerging railroads and all over the country (27). This special kind of salt is used to manufacture glass, enamel and other ceramics, and in the pharmaceutical and agrichemical industries. All of it was mined from the dried beds of paleolakes that once existed in the region. It is estimated that the value to the US economy of borates alone has topped $1 billion. The US deserts are also home to copper. Salts have also proven a great resource for the Chilean economy although today its lithium resources have also taken prominence on the world stage as battery development increases for better power storage and production in the new generation of electric cars (28). No other desert has as much abundant salt as this desert. It is estimated that during the First World War alone, some 3 million metric tons were mined. Like the US deserts, copper is present in Chile. Australia's deserts are a source of lead and zinc, uranium, gold and silver. As far as non-metal resources are concerned, deserts are also home to clay, beryllium, pumice (where there was past volcanic activity), nitrates and lithium. 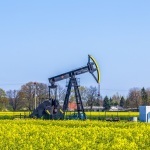 It is also no great surprise that some of our most abundant oil deposits are found in desert regions, particularly the Middle East, central and South America, in the driest places on Earth. These were once marine environments, but the lakes and seas dried up, allowing for the chemical processes that turn organic material into crude oil to create enormous deposits. Oil is not unique to dry environments though and the most important process is the presence of organic material and the right chemical conditions. 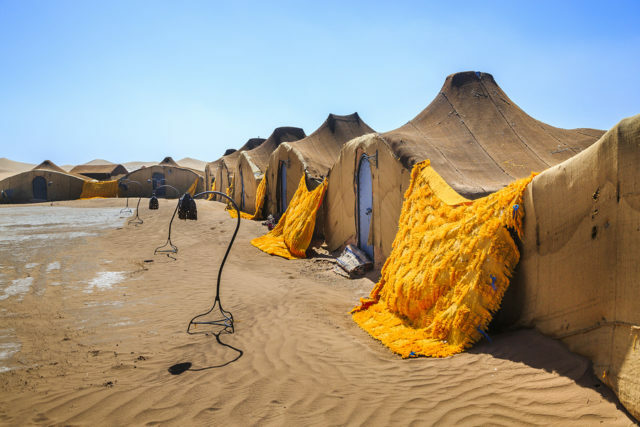 There is some debate whether the Bedouin tribes of the Middle East are true nomads in the traditional sense. They certainly perceive their lifestyle in this way although technically they live a semi-nomadic life. In summer, they settle on lands bordering deserts where agriculture is possible and food crops for livestock is abundant. They tend to move around a lot more in the fall and winter time during the rainy season (29). There are different groups of Bedouin tribe who name and classify themselves based on the types of livestock and animals that they rear. For example, there are camel Bedouins which comprise the largest tribes and are distributed over the widest areas of the Middle East, incorporating most of the Levant (Jordan, Syria, Iraq) the Arabian Peninsula and North Africa including Egypt, Libya and Sudan. Much of their lifestyle is unchanged since the Bedouins first roamed the lands although not completely. They have adapted to many aspects of modern life including motor vehicles to move around where possible. Just as the technologies of Bedouin tribes have changed, so have the concept of a home which can be a tent, a stone building or even the desert land (30). They are ethnically Arab, and most are now Muslim. Relationships between other ethnic Arabs and Bedouins has always been mixed. They have sometimes suffered horrifically at the hands of national governments while some Arab people perceive the Bedouin as “pure” or romantic much in the same way that other countries romanticize other lost traditions such as the Roma travelers of Eastern Europe or the Amazonian “lost” tribes who have only had limited contact with the outside world. At the end of the 20th century, less than 1% of the population in countries where Bedouins still roam maintain that lifestyle. The Bedouin are not the only nomadic or semi-nomadic life. The Marsh Arabs so brutally oppressed by Saddam Hussein in the early 1990s were semi-nomadic, as are some elements of the Kurdish peoples of southeastern Turkey. Some aspects of Mongolian life in the Gobi Desert, and the Sami people of northern Scandinavia and the arctic islands such as Svalbard continue in their semi-nomadic traditions. Like their counterparts to the south, they too are increasingly moving to permanent settlement. Deserts are vital in many ways ecologically. Firstly, they are home to 17% of the human population who have adapted or adapted to the various desert biomes. Water is vital to life and although they lack this necessary resource, their unique ecosystems provide survival and resources for the plant and animal species that live there (31). Deserts carry out vital planetary environmental functions too. Most of these species have adapted to the uniquely harsh environments of both hot and cold deserts and everything in between. Often, these species do not exist in other types of environment. For that reason alone, it's necessary to conserve desert spaces and to avoid encroaching on them unnecessarily or altering them for other purposes. They are home to various livestock such as camels, goats, and antelope that provide food and livelihood for people. Desert shrubs and trees that produce fruit such as dates, figs, and olives (32), are important food crops globally. Many are not aware that deserts are a net carbon sink, providing some relief from the increase in greenhouse gases. This will be problematic while carbon emissions continue to increase, and world governments will need to do something about it in the future. The discovery was made when researching bacteria in the desert. Research suggests that bacteria located in massive aquifers beneath the sand and in the sands itself, are capturing carbon from the air. In theory, the aquifers could hold more than the entire global population of plant material at present at 20 billion metric tons (or 22 billion imperial/US tons) (33). Finally, deserts, due to their location, are important sources of generating renewable energy. It is no coincidence that the world's solar arrays are located in the hottest places on the planet. Smaller solar panels convert light into energy, but the large arrays in the deserts work differently. They harness the heat and use mirrors to reflect and divert into the array, to generate much more energy per square foot. 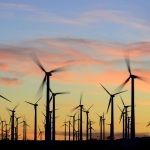 Deserts are also useful sources of wind power. There are always desert winds, but at certain times of the year wind is much higher which can also generate energy (34). Deserts attract millions of visitors every year. 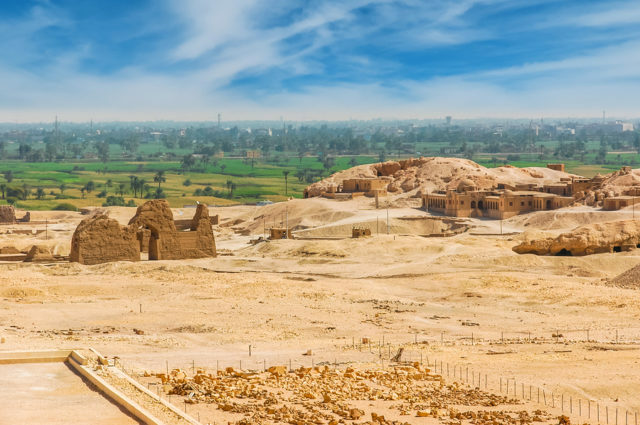 From the deserts of the Middle East and North Africa where visitors may see the Great Pyramids of Giza in Egypt, to Jordan's city of Petra, Carthage and others, they are great places to see well-preserved archaeological ruins of the past. Here in the USA, there are plenty of other examples of ancient cultures in the desert. The Chaco culture, Pueblo peoples such as the Anasazi and Hohokum lived in the deserts of modern New Mexico, Utah, and Arizona. The Anasazi houses at Mesa Verde is incredible site, as is the Casa Grande monument in Arizona, built by the Hohokum Culture. In South America there are many sites and artefacts recovered from the Atacama. In short, people have settled deserts for hundreds of thousands of years and the dry nature makes such remains attractive to visitors (35). Not that culture and history is the limit of desert leisure and tourism. Some visit to see natural wonders such as Grand Canyon in Arizona, the great salt plains of the Atacama Desert or take a 4x4 vehicle or a hot air balloon ride across the sand dunes of the Arabian deserts. The semi-arid Monegros Desert in northeastern Spain plays host to an annual music festival called Monegros Desert Festival while the cold and arid landscapes of Greenland and Iceland draw visitors from all over the globe. The wide-open spaces of deserts can host great numbers of people without putting too much of a strain on local infrastructure. Despite the strain that tourism can put on these delicate ecosystems, they are providing much-needed money and jobs to areas. Ecotourism is helping developing nations especially find ways of preserving those landscapes (36) when historically, deserts have been neglected both in the conservation debate, and the funding and planning. Geological data suggests that at 43 million years, the Namib Desert in southwestern Africa is the world's oldest desert, but by no means its largest (that would be the Sahara). Most remarkably, nothing has changed there for some 2 million years, surviving multiple Ice Ages (37). It consists almost entirely of sand dunes and gravel plains and is one of the most inhospitable places in the world and it runs right up to the South Atlantic coast. It takes up almost half the surface area of Namibia. It's long history and dry environment makes it a perfect searching ground for archaeologists and anthropologists; it's home to some of the oldest cave art in the world, preserved almost perfectly due to the desiccated conditions. Twyfelfontein is overshadowed by Brandberg for cave art, but the richness and diversity attract tourists and researchers alike (38). It's hardly surprising that people settled here; Twyfelfontein contains one of the deserts few natural springs. The Namib Desert contains several national parks and reserves which home several species of zebra, jackals, and hyena. These warm-blooded mammals are in a precarious position due to the heat and dryness of the environment. Yet not all the Namib is desert. While the north is dry and sandy, the south is more like a semi-arid region with succulents, and the central region is full of gravel and gypsum plains. The world's last continent is subject to international treaties that no single country can claim it. Yet most developed nations have scientific settlements on the cold, dry and mostly inhospitable land (38). What little life there is clings to the boundaries of where the land meets the sea and a few rocky outcrops. This includes penguins, albatrosses, seals, some species of gull and tern, and many types of insect. The interior is a different matter entirely. Covered in year-round snow and ice which is, in places, nearly 2km thick (1.2 miles) it is surprisingly one of the driest places on Earth. There is little precipitation and the snow and ice present has built up over hundreds of thousands of years. Rather than four seasons, it has just two: summer where it is always sunny where the sun never sets, and winter where it is always dark and the sun never rises. It's at the pole, so experiences the most extreme conditions of the planet. This especially means the temperatures. In 1983, the Russian Vostok Station recorded the coldest ever temperature on planet Earth at -89.2 �C (which is -129�F). In 2010, satellite data appeared to suggest a lower temperature than this was recorded but it was never confirmed or backed up by other data (39). Straddling China and Mongolia, the Gobi Desert is Asia's largest. There are steppe and mountains to the north, more desert to the west, plateau and plain to the south. Its fame lies in the being the center of the Mongolian Empire which conquered much of Asia and into Eastern Europe in the Middle Ages. It's creation as a desert is largely one of unfortunate topography; it's formed by something called “rain shadow” (40). The plateau and plains to the south draw off moisture from that direction. The Indian Ocean is a hotbed of rainwater during monsoon season but the Gobi sees none of it. It is a cold desert, but it is largely sandy. This creates a striking and unusual sight during the coldest periods of frost-covered sand dunes. It experiences most of its moisture in the winter which arrives in the form of snow run off. Its summer is hot: hotter than most other cold deserts with temperatures reaching up to 37C (or 99F) while the coldest temperatures recorded are around -32C (-27F). 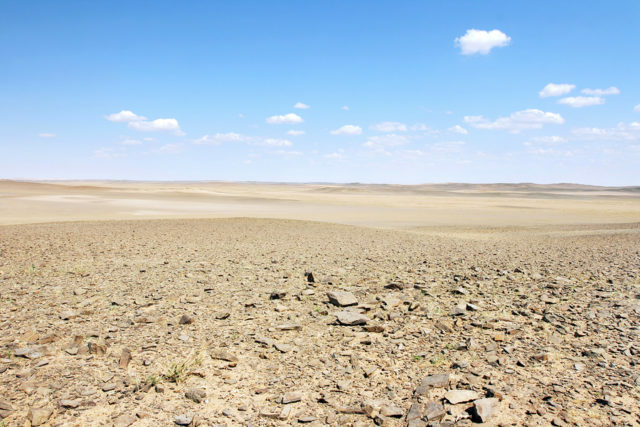 The Gobi is useful for archaeologists as with any desert, but it's also been one of the richest sources of fossil findings for paleontology including the first evidence of dinosaur eggs (41). It's home to many modern protected species including snow leopards, wolves, multiple species of camel, gazelles, and polecats amongst others. The Gobi is home to some of the world's largest copper mines, some of which have been steeped in controversy. There are few better examples of the ecological dangers of desertification in the 21st century. Its continued expansion has been put down to increased carbon emissions, agricultural activity and deforestation. The Gobi formed naturally, but it is humanity fueling its expansion (42). Not the largest of Australia's deserts (that's Great Victoria Desert), Gibson Desert is considered one of the most interesting because it is largely pristine (43). It's amongst the purest deserts in the world. The semi-arid landscape is located between a giant lake of salt (Lake Disappointment) and two other deserts (Great Victoria and Little Sandy). It's largely a gravel bedrock base and the most abundant plant is grass, typical of semi-arid deserts. The red sandy plains of the desert are often held up as the typical topography of the Australian Outback although in reality, the interior of Australia is a mix of desert types. Several other notable facts about the Gibson Desert include the belief that it was the home to the last indigenous tribe to make contact with western civilization (the Pintupi). During a drought in the 1980s, they left their desert home to search for help. 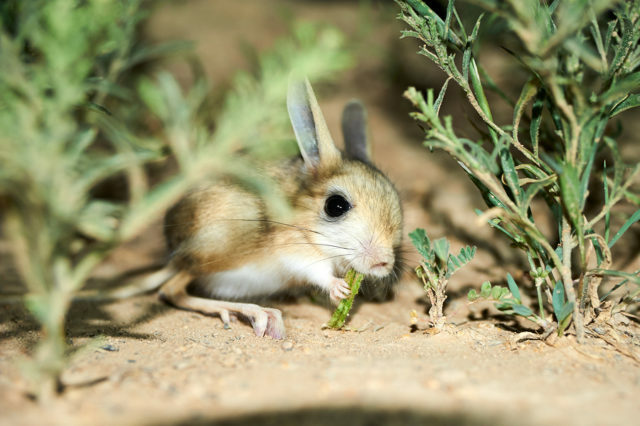 Increasing urbanization and urban landscape infrastructure on the border with neighboring deserts means its of conservation interest to prevent habitat loss of many species that call the Gibson home. In 2015, researchers were surprised to find an extensive oasis in which was a new type of snail that has made a home there (44). Deserts, like other biomes, continue to remain a source of the discovery of new species as well as presenting new problems for conservation and ecology in balancing out increased desertification against the preservation of existing deserts. Spain is home to several deserts, most of them semi-arid as Europe's climate is simply not hot enough for the kind of hot and dry deserts seen in North Africa and the Middle East. Covering 200sqkm, the Tabernas has slightly higher rainfall and cooler temperatures than its neighbors and most typical semi-arid deserts but it maintains the criteria that determines what is and is not a desert. What little precipitation it receives usually falls in the form of torrential rains. Its interesting climate does not end there; the Tabernas is a microcosm of several types of desert in such a small area. Some of the areas of the southern lowlands are hot desert, the bulk of it is semi-arid, but the highest uplands to the north have signs of cold desert (45). This precipitation means it has more abundant biological life than most other deserts. It's a haven for species such as sea lavender which are threatened in other parts of Spain but thriving in the Tabernas. In winter, toadflax flowers, creating a vivid white appearance to the desert. Animal species include the peregrine falcon which is an internationally protected bird of prey, jackdaws (a common type of corvid - related to crows - seen across Europe), ladder snakes, and North African hedgehogs. Yellow scorpions, tarantulas and a spider called Black Widow which is related to the deadlier spider of the same name make up the arachnids. Like the Gobi in Asia, the Mojave was also created and is maintained by rain shadow meteorology. The phenomenon has created the driest environment in the North American continent and straddles the states of Nevada and California, while edging across the Utah and Arizona borders too. Of all the deserts on the continent, the Mojave is the smallest; winter temperatures are comfortable (25C/80F) in the valleys and much colder on the mountains. They rise quickly through the spring and summer, rarely falling below 32C/90F, sometimes topping 38C/100F in the highest part of the summer season (46). Its most associated with the Joshua Tree; the desert's border is said to end where the Joshua is no loner present. This is the desert on which Las Vegas is located, bordered by the Great Basin Desert and the Tehachapi Mountains. Geologically, it is simple to trace these borders because both the Garlock and San Andreas Faults have created the mountain ranges that enclose it to the west and south - the San Gabriel and San Bernardino Mountains. Economically, the Mojave is the most important desert tourist destination in the US due to the presence of Las Vegas to the east and organized tourism into the desert's interior. This generates money for the local economy and especially for conservation issues in the State Parks, National Parks and National Preserves that have been established within its boundaries. Finally, the Hoover Dam is within its boundaries, preserving water for the settlements in the Mojave and providing hydroelectric power although this has not been without controversy or damage to the ecosystem (47). We have already described Atacama as potentially the driest place on Earth. This is not a title granted lightly. Its precipitation is so negligible that it's considered virtually zero. It's possible that parts of the Atacama Desert have never experienced rain. Its age is likely to exceed 200 million years. If this is true, then it is far older than the Namib which has a confirmed 43-million-year history. Some of the weather monitoring stations which have been in place for decades have certainly never registered rainfall. Elsewhere in the desert, the average annual rainfall is about 15mm (about half an inch) while some areas experience around 1mm. The highest peaks have year-round snow cover which may have been there for decades having fallen and never melted away. Medium height mountains have no glaciation even in the coldest months of the year. Due to its aridity and alien environment, the Atacama has been used as location filming for recent Hollywood productions set on Mars. It is home, perhaps surprisingly, to some striking flora and fauna that make use of the limited moisture available. The most arid areas - those that may never have experienced rate - are unable to support many forms of life, although a study showed some microbial life in those areas (48). Thyme and saltgrass are abundant in some areas, the pimiento tree, and some succulents. In those areas where rainfall does occur, flowering seasons are short and colorful, presenting the notion that the desert is lusher than it appears. There are few lizards or amphibians, and the wettest areas on the Pacific Coast are home to humboldt penguins, flamingoes, while the limited mammals include chinchilla and American grey foxes. As more rain falls, as more moisture is retained from meltwater run off, more water passes through any rivers and lakes that might form seasonally in these deserts, this will change the environment over time. Far from being a good thing, it puts the biome at risk, changing it from a desert into something else. The biodiversity is at risk and potentially threatened species could die out in those areas or become extinct; this is a particular concern for species that exist in just one desert on the planet. An example of this is the increased rates of desert songbirds in the US experiencing dehydration (49). 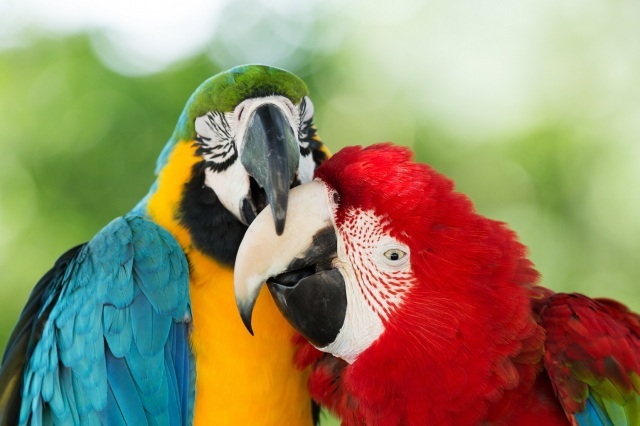 Such birds, because they are warm blooded and because they fly at elevations to which warm air rises (plus a lack of suitable shade), are far more susceptible to dehydration and as the climate gets hotter, some deserts are getting drier. This is a risk for all desert-dwelling warm-blooded creatures, but especially birds. Bison and buffalo numbers in North and Central America were in a precarious situation a century ago, but recent conservation efforts are seeing their numbers increase. Yet belief in the restoration of bison to certain environments has not met with universal approval. Sometimes, local politics gets in the way. This is certainly the case with the northern end of the Chihuahua Desert where efforts to re-introduce bison along the US-Mexico border has met with hostility. Documentary evidence from pre-Columbian peoples in what is modern Mexico suggests that bison were common along the borders of the desert and the grasslands to the north. But this is not confirmed; nor is it accepted on all sides where the validity of ranching is being challenged in Mexico and the US (51). Deserts have always been centers of mining activity. As discussed above, they naturally develop oil and precious metals and gem resources through their unique geology. This industrial mining and prospecting can have multiple negative effects on the surrounding desert which present multiple sustainability challenges. If oil spills, it is an ecological disaster that could cause long-term or even permanent damage to the landscape. Even when safety is observed 100% and in sites where there has never been such an ecological disaster, the infrastructure of the mine can create problems. Human settlements at the site will include roads to get to and from the mine, carbon emissions from the vehicles, roads causing environmental degradation (52). These are all problems that need to be addressed when planning and building a mine. If it is placed in an area where there are threatened species, this too can create problems for those species. In the Sahara, potassium-cyanide poisoning is an ongoing problem around the gold mines (53). Fracking: What Is It and How Will It Affect You?